In our Lync lab, we are always running into scenarios where we would like to test various functionality against known VOIP providers and equipment. This usually results in an increased levels of frustration as Lync does not play well in the land of UDP SIP. Enter FreeSWITCH. 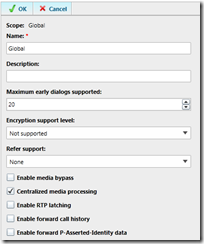 UDP to TCP bridging which allows Lync to work with VOIP providers such as FlowRoute and PBXs such as 3CX. Full NAT support for those times when you just have to be behind a firewall. Much better support for direct inbound (private) phone numbers into a Lync system using extensions. Support for non-Lync conference phones such as the Polycom IP 6000. Support for Lync 2010 as well as Lync 2013! The configurations documented in this article are non-standard and, as such, are not supported by any of the vendors referenced within. These configurations are designed in, and for a test environment. Utilizing these configurations in a production environment will be undertaken at your own risk. IMPORTANT: It is recommend you read and understand this entire blog entry before making configuration changes… it’ll make your life much easier. Lync 2010, 2013, Enterprise, and standard, oh my! For brevity, this article was written using screen shots of a Lync 2013 Standard Edition install. Most configuration instructions will directly apply to Enterprise Editions as well as Lync 2010 with some minor tweaking. Coffee or your caffeine of choice. 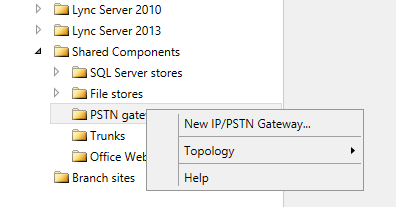 Launch Lync Server Topology Builder and load the current topology. Drill down to Mediation pools and highlight the mediation pool which will service outbound calls. IMPORTANT: Be sure to install FreeSWITCH on the server pointed to by your DNS entry! This defines the name FreeSWITCH will respond with during SIP communication. The inbound SIP port used by external VOIP traffic. Make sure you configure you VOIP provider to communicate with FreeSWITCH using this port. The port used by your internal Lync and VOIP devices. The internal IP for your FreeSWITCH server. Set according to your VOIP providers configuration. See the .XML file for example inbound and outbound routing. Solution #1: Make sure nothing other than Lync’s own services use ports between 5060 and 5080. This is the solution we selected as it is quick and easy. Solution #2: Make sure FreeSwitch starts AFTER Lync Server Front-End service has started. This entry was posted in Lync on May 14, 2013 by ArmgaSys.